Consider this an early Christmas in July gift. 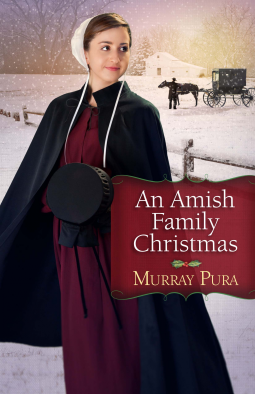 I absolutely love reading and I came across a great fiction book, An Amish Family Christmas by Murray Pura, that I simply had to share with you. Naomi is no stranger to pain and heartache. Her family was involved in an accident and her parents and sister were killed and her brother, Luke, was left catatonic. He will not speak. Naomi’s sister-in-law, Rebecca, has moved in to help her during this difficult time. As if this is not enough to try and contend with, her husband, Micah, who has been gone for a year without any contact, comes home from being a medic in the army in Afghanistan. His homecoming wasn’t a joyous celebration, but rather one of silence. Micah was put under the ban because of his involvement with the war. Will the leaders of the church come around and lift the ban? As time continues to march on, it looks like things are going to remain silent for Micah and Luke. Will it take another accident to bring about change in this community? This was such a wonderful story. I quick read on a hot summer afternoon.